Pro Tools 11.1 came with a new FREE plug-in - Avid Pitch II, both in Native and DSP formats. We will shortly be releasing some free Pro Tools video tutorials to show you some cool ways to use Pitch II in your productions, in the meantime here’s a quick guide to this great new Pro Tools plug-in. Pitch II should not be confused with autotune type plug-ins, it does not fix tuning but changes pitch, either in realtime via AAX native or DSP or as an AAX AudioSuite plug-in for offline processing. 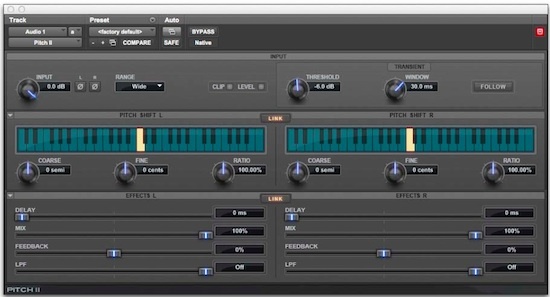 Pitch II can be used to thicken instruments and voices by making fine tuning changes or to transpose audio. Avid’s Pitch II plug-in uses granular technology to make the changes to the audio, this chops up the audio into tiny grains and then ressembles them adding small crossfades - this means any pitch shifting does not affect timing. This kind of effect has been used for several decades, previously done using hardware such as Eventide or Yamaha SPX units. One of the most popular uses for this kind of effect is to make stereo out of mono signals, the great news is that Avid Pitch II works as a mono to stereo effects as well as a stereo-stereo effect. As well as pitch changing tricks, Pitch II offers delay effects too, add the LPF filter and you have an additional and flexible delay line in the tool-box.